~Routine, Let's face it!~What's really great about the same o' same o'! It's funny how we get into a routine, and it automatically becomes second nature to us! As I am preparing for my day, something clicked as I brushed my teeth! My powder room has three floating shelves instead of a traditional medicine cabinet, so everything is rather exposed. As I brushed my teeth, I actually took noticed of all the things required to really keep a healthy glow! As an avid skincare user, my motto is 'good skin, very little makeup', and to achieve such one must keep a routine, the one I use has not deviated that much for years, well, unless a product was discontinued, but I still kept it solid. Are there certain products that you can not do without? 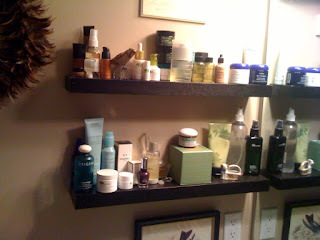 To the following companies & spas below, my face & well-being thanks you!